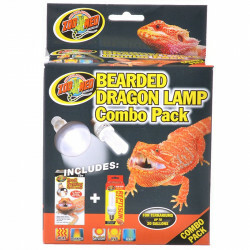 Welcome to the Bearded Dragon Lighting superstore! Like all reptiles, bearded dragons are dependent on the warming light of the sun to provide their energy and facilitate natural activities. Pet bearded dragons without direct access to the sun, however, need to rely on artificial means of light and warmth. 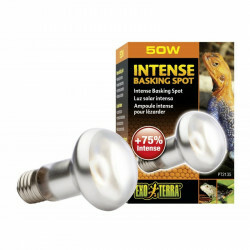 Our selection of basking spot bulbs has the perfect bulb for giving your beardie the ideal warming spot, and the very best T5 High Output bulbs for giving universal light to your pet's terrarium. Don't forget about UVB light - an essential component of all reptile lighting, as it provides the needed Vitamin D that they don't get from the sun. Pet Mountain's Bearded Dragon Lighting store features top quality products from some of the most trusted names in reptile care and terrarium lighting, including Zoo Med, Hagen Exo-Terra, and Zilla. The Zoo Med ReptiSun 10.0 UVB Bulb is ideal for reptiles housed in larger vivaria whose natural environment and behavior patterns necessitate increased UVB exposure. This fluorescent bulb features more UVB output than any other lamp! Effective at distance up to 20", compared to 12" with the 5.0 UVB, this lamp will provide the UVB your pet needs in any cage-situation for up to a full year before needing replacement. 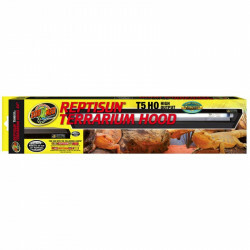 The Zoo Med Reptisun T5 HO Terrarium Hood High Output is a High Output light fixture for your reptiles. 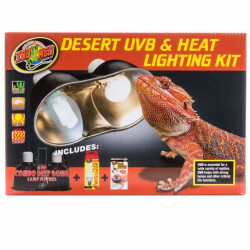 Use with a Zoo Med ReptiSun T5 HO lamp to provide UVB, UVA & Visible light for your reptile. The Exo-Terra Sun Glo Basking Spot Lamp for reptiles and amphibians is a broad spectrum daylight spot lamp with a Neodymium sleeve.